“A Most Grievous Fault” by Kathryn A. Imler is a riveting mystery surrounding the murder of Father Henry Felger, pastor of St. Hedwig’s Catholic Church. By all appearances, it seems Father Felger slipped on the icy steps outside the parish and hit his head, but further investigation rules his death a homicide. With the culprit most likely being a parishioner or church employee, accusations fly, and so the mystery begins. When the church cantor, Libby Kinder, finds herself as one of the main suspects, she begins to investigate on her own. What she finds will forever changes the lives of many. Containing all the elements of a great mystery, “A Most Grievous Fault” is certainly a fun read. The writing style of this new author will indeed draw a loyal following. Rich descriptions of the church, the surroundings, and the even the weather conditions, make it easy for the reader to imagine being right in the thick of plot. One can almost sense a certain eeriness when enveloped in the midst of the sanctuary. The writing clearly depicts, at least to me, a cold, sterile environment, in spite of being in a place of worship. But, perhaps I digress to memories from long ago. The characters are definitely one of the strengths of the book. Well developed and genuine, the connection with the reader grows alongside each character. The interactions between the characters are so realistic; it is easy to get caught up in their daily drama. Libby is a likeable protagonist with real issues, and realistic expectations. The stance of the Catholic Church on women and their roles in society add an additional dimension to the story, along with other relevant issues today. 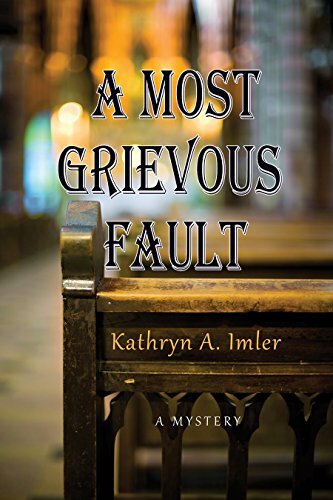 Overall, “A Most Grievous Fault” by Kathryn A. Imler is a well-written, suspenseful mystery/thriller that I highly recommend to fans of the genre.